Is This The Ultimate Mixer For Podcasting? 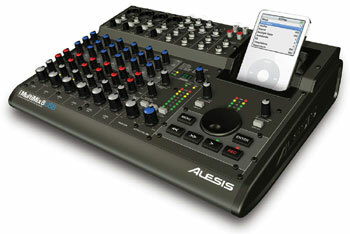 Musikmesse: Alesis has introduced the iMultiMix 8 USB Mixer with professional mixing and direct-to-iPod recording. The mixer features a built-in dock that lets you record through the mixer directly to any 2nd through 5th generation iPod. The iMultiMix 8 USB is the world’s first mobile recording mixer with iPod transport controls and a control wheel built right into the surface for control of the iPod while it is being docked in the mixer. Files recorded into the iPod are CD quality, 16-Bit, 44.1 kHz .wav files, and are transfered to your computer next time you sync your iPod. The iMultiMix 8 USB has the same effects as the Alesis MultiMix 8 USB, one of the most popular recording mixers available. Vocalists can add professional quality reverb and guitar players can create flange effects, all of which are mixed and recorded to the iPod. The iMultiMix 8 USB is scheduled to ship in Q3 2007 with a suggested retail price of $499.